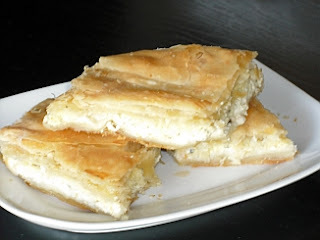 This is another way of making cheese pie - Tiropita. This recipe uses bechamel as well as Feta cheese. It's a common way of making the pie here in Greece and is extremely filling and nutritious, as well as being really tasty! Whisk the 4 eggs into the béchamel, mix and set aside to cool. When it has cooled, add the feta, mint and pepper. Turn over lightly a couple of times and set aside. Roll out another ball of dough into a circle approx. 40cm diameter. After the 1 hr has passed, roll out one of the squares on a floured surface, large enough to cover the bottom of an oven dish (approx. 30-35cm diameter and 5cm deep) as well as the sides and to go over the edge. Brush the oven dish with some of the oil and place the pastry on the bottom, flattening it with your hands, up the side and over the edge. Brush the pastry with some more oil. Shape the pastry around the edge. Brush over the top with the remaining oil. Score the surface into portions. Place in a pre heated oven at 180 degrees Celsius for approx. 1 hour, until it has turned golden brown. Nice Recipe to me. Many thanks for the Awesome Recipe and Way of Delicious Food.